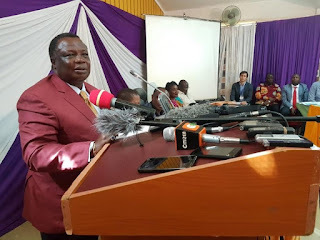 Monday August 13, 2018 - Central Organisation of Trade Unions (COTU) Secretary General, Francis Atwoli, has asked President Uhuru Kenyatta to order Directorate of Criminal Investigations and the Director of Public Prosecutions to investigate corruption at the National Hospital and Insurance Fund (NHIF) and the National Social Security Fund (NSSF). Addressing a Press Conference on Monday, Atwoli said he has evidence that massive looting is taking place at NHIF and NSSF offices. The COTU leader said he and fellow NSSF trustee, Jackline Mugo, have on several occasions blown the whistle on looting at the two institutions but their claims have been ignored by investigative agencies. NHIF Chief Executive Officer, Geofrey Mwangi, is said to have looted Sh 6 billion from the public funded institution and he continues to steal despite Atwoli’s warning. Mwangi, who comes from President Uhuru Kenyatta’s stronghold of Central Kenya is said to be untouchable and has bought several plots of land in Karen worth over Sh 1 billion. “@EACCKenya investigating or waiting to be bribed with houses in Nyayo Embakasi Estate again?” renowned blogger, Robert Alai, asked last month.